Reflections on the 10 year Anniversary of the 2006 Mega-Marches for Immigrant Rights. Community members continue the struggle amidst rampant discrimination and xenophobia. 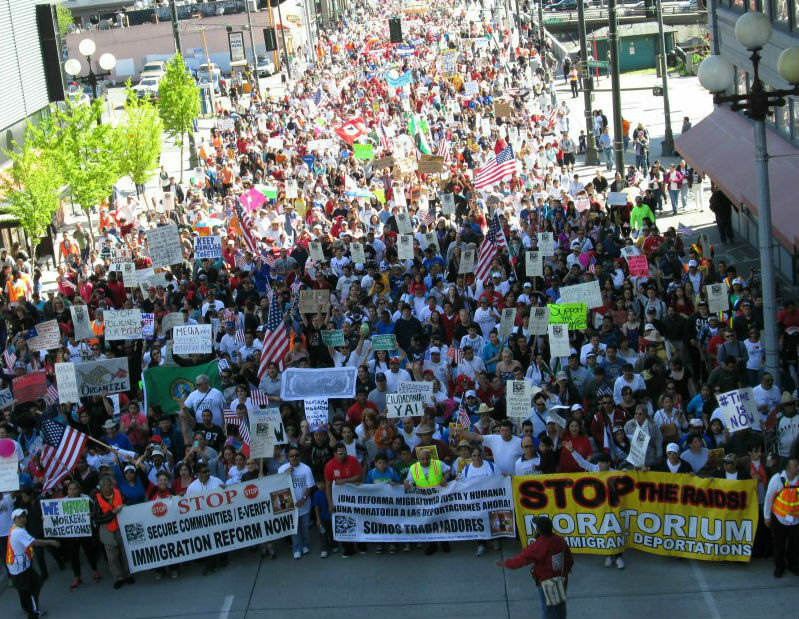 SEATTLE – Sunday marked the 10 Year Anniversary of the April 10, 2006 National Day of Action for Immigrant Rights March. The march was one of two major marches to take place in the Spring of 2006 (the other taking place on May 1st 2006) and was a critical event in recent history. Both events were the largest mass demonstrations to take place in Seattle since the WTO Demonstrations of 1999 and the Anti-Iraq War March of 2003. The marches were part of a larger coordinated effort in which cities nationwide took to the streets to protest against the draconian, H.R. 4437 legislation (passed by the U.S. House of Representatives in December of 2005). The legislation, also known as the Sensenbrenner Bill and named for its sponsor, Rep. Jim Sensenbrenner (R-Wisconsin), would have: 1) made it a felony to assist undocumented immigrants, 2) sought the building of 700 miles of militarized border fence, 3) fined undocumented immigrants thousands of dollars during deportation procedures, and 4) forced local and state police to act as de facto Immigration Customs Enforcement (ICE) auxiliary agents. In essence, besides the alarming encroachment into local law enforcement agencies, the bill would have instantly criminalized schools, teachers, clergy, churches, social service workers and agencies, as well as family members of undocumented immigrants, simply for the act of providing basic humanitarian aid (e.g., food, clothing, shelter). The xenophobic fervor was especially acute, considering that residing in the country without valid documentation is a civil matter, not a criminal offense. The bill passed through congress with a Republican majority, sprinkled with a few votes from members of the Democratic Party. Rep Rick Larsen (D-Washington), was one of the Democrats to have the dubious distinction of voting for the bill. The urgency felt by many immigrants and their families in wake of H.R. 4437 led to some of the largest mobilizations in U.S. history. Locally, the response to the passing of the Sensenbrenner Bill led to a wave of protests and demonstrations that set a new precedent for Washington State’s Latina/o population. Youth in high schools, concerned about their parents, led walkouts and demonstrations across the state. University students mobilized on their campuses and passed student government resolutions denouncing the legislation. Community organizers branched out to different entities in the labor, faith, and social justice communities, to march with the goal in mind to stop H.R. 4437 from becoming law. Nationally, the marches, demonstrations, boycotts, and general strike on May 1st 2006, proved decisive in killing H.R. 4437 and its legislative equivalent in the U.S. Senate. Soon after this victory, the movement forked as many community organizations continued fighting legislation at the local level, while several other groups demobilized in anticipation of the 2006 and 2008 elections, and the “possibility” of using the electoral process to attain the movement’s goals. In the 10 years since the marches, conditions remain variable for many immigrants throughout the country. The electoral process and election of democrats to the House of Representatives, Senate, and White House didn’t deliver on the promise for a just immigration reform. Tragically, as the War in Iraq and Afghanistan, the Economic Depression, and Health Care Reform took top billing in policy, the same regressive, enforcement-first policies enacted by the Bush Administration continued unabated. Institutional neglect and congressional lip service allowed for an estimated 3 million immigrants to be deported. As people waited for congress to move, conservative states enticed by xenophobic wedge issues, tried passing in their own legislation, most notoriously in Arizona with the passing of S.B 1070. In light of what transpired nationally, in Seattle and the Puget Sound, organizers re-shifted their energies to local campaigns to create a sanctuary city in Seattle, to allow undocumented immigrants to attain a driver’s license to safely operate a vehicle, and to create an ordinance that outlawed wage theft (immigrant day laborers were especially vulnerable). It is through continued support and solidarity, that the immigrant rights movement in Seattle has been able to maintain a steady presence and has continued the fight for social justice. International Human Rights Day, December holidays, offer an opportunity to reflect on the plight of immigrants in the United States. As this year nears its end, we reflect upon the happenings that have transpired over the course of the last year. In the month of December two dates stand out for us culturally and symbolically, those of International Human Rights Day, which falls on December 10, International Day of the Migrant, on December 18, and the December Holidays, including Las Posadas, celebrated in Latin America and by U.S.-based Latino Immigrants. What make these days especially pertinent, are the larger themes of peace, inclusion, and the offering of shelter for those who seek peace, tranquility, and a dignified existence. It is in this season, and with the aforementioned themes in mind, that we support, and stand in solidarity with those who flee violence and systemic negligence abroad, and continue to work at home to fight for social justice in our immigrant communities. Though there are many factors at play globally, which impact migration away from one’s place of origin and draws someone to a distant land in search of a better existence, we also wish to acknowledge the factors at work domestically, which place many families in a state of distress. These factors, which include, but are not limited to; rampant xenophobia, racism, anti-immigrant legislation, classism, denial of basic civil and human rights, and due process in the legal system, have worked to systematically dehumanize our immigrant sisters and brothers. One prominent example is with the institutional xenophobia as practiced in the State of Texas. In lieu of omnibus legislation to reform immigration, the Obama Administration issued an executive order, establishing the Deferred Action for Parents of Americans (DAPA) program, as a way to offer relief from deportation to undocumented parents of U.S. citizen children (the order also expanded the Deferred Action for Childhood Arrivals “DACA” program). Within a month of the November 2014 unveiling of the DAPA program, the State of Texas and several other states with Republican Governors, filed a suit in the District Court for the Southern District of Texas, to block the implementation of the order. A year since the suit, the executive order lies dormant as legal challenges ensue. Court injunctions aside, the State of Texas has also used its agents to deny birth certificates to the U.S. citizen children of immigrant parents. Likewise, the aforementioned action seems to also be in line with the right wing’s rhetoric and continued insistence on denying these children the protections afforded to them by the 14th Amendment to the U.S. Constitution. In essence, the act of denying birth certificates, in turn leaves the children in legal limbo, as they are treated as second class citizens. This year on International Human Rights Day, as well as on International Day of the Migrant, we reaffirm and reiterate our previous stance in support of our communities that are socially and economically marginalized. We side with the downtrodden, those who are denied the opportunity to better their social condition. It is with this thinking in mind that we also support the struggles of our sisters and brothers in other communities of color who also fight against police brutality, economic inequality, and other maladies that come as a result of institutional neglect. We also invite all others of like mind to stand with us in the struggle for civil, human, and worker rights for all, regardless of place of origin. An injury to one, is an injury to all. Thousands take to the streets of Seattle for the 14th Annual May Day March for Workers and Immigrant Rights. ph: 206.650.2106 and 206.696.1348, em: info@elcomitewa.org, Twitter Tag: #May1stSea. Participants voiced the need for a livable wage for all workers and a cease to indiscriminate deportations that tear families apart. SEATTLE – An estimated 7 to 10,000 demonstrators took to the streets of Seattle to participate in the 14th Annual May Day March for Workers and Immigrant Right. The events began at Judkins Park at 2:00 p.m., with a brief program that included music, speeches, and logistical announcements for the march. Participants then filed westbound, on Lane Street to start the March at 3:00 pm. At around 3:30, the march departed from St. Mary’s Church, with Danza Ce Atl Tonalli, setting the tone. Despite a detour from the regular march path of years past, due to construction on the western portion of Jackson Street, the march still drew a larger attendance than last year. The march swelled, with contingents of groups joining along the way on Jackson Street and 20th Avenue, along Boren Avenue, as well as on several street corners along First Hill, and Downtown Seattle. Included among these groups, were contingents for organized labor and for a coalition of activist youth groups from the Seattle area. Other speakers at the rally also addressed larger regional issues, with updates on the ongoing campaign by immigrants that are detained at the Northwest Detention Center. One speaker detailed the conditions in the Tacoma-based center, which include inadequate medical care, poor nutrition that is provided, unreasonable charges for communicating with family via telephone, and mistreatment and neglect by center staff in general. These grievances were what lead to a hunger strike in late February. The campaign for better conditions is ongoing. There was also a call to continue the Boycott of Sakuma Farms products by members of the organization Familias Unidas por la Justicia in Skagit County. Workers have been in a labor dispute over work conditions and wage theft over the last year. They will hold a march for Farmworker Dignity on Sunday, May 4th in Bellingham. “This for me was such an honor and privilege that I cried when Juan Bocanegra called me and asked if I could sing for May Day,” said Ruth Alfaro, who goes by the stage name, Latin Rose. “When I saw all my people marching and chanting for the same cause… It made my soul sing! When I started singing the song that I made for the Latin and LGBTQ community called Vive La Vida I got such a rush, this moment is what I was born for!…No more deportations, no more discrimination, freedom and justice for all! 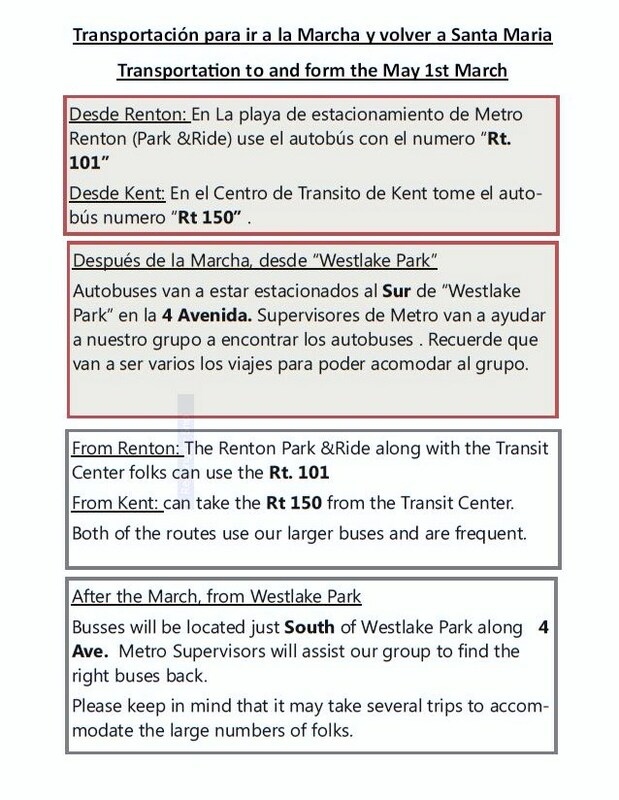 For more information, contact the following: El Comité and the May 1st Action Coalition, ph: 206.650.2106 and 206.696.1348, em: info@elcomitewa.org, Twitter Tag: #May1stSea.